Under a competitive process, the U.S. Army Corps of Engineers (USACE), New England District has awarded Nobis Engineering, Inc. (Nobis) a 5-year, $25,000,000 indefinite delivery/indefinite quantity type contract to perform environmental remediation services at the Elizabeth Mine Superfund Site in Strafford, Vermont. 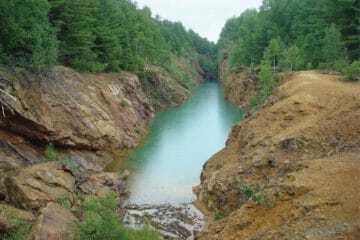 The Elizabeth Mine Superfund Site is an abandoned copper mine and is recognized as one of the largest and most intact historic mining sites in New England. The mine was operated from the early 1800s until its closure in 1958 with more than 3,000,000 tons of ore mined. The mine area is a source of heavy metals and sediment impacts to the Copperas Brook and Lord Brook watersheds, which all discharge to the West Branch Ompompanoosuc River and eventually flow into the Connecticut River. Under this contract Nobis will manage and perform the consolidation and capping of mining waste in the Lord Brook Source Area to minimize the discharge of contaminants to Lord Brook. Prior to consolidation and capping activities, the South Mine and South Open Cut pit lakes will be dewatered and steep exposed bedrock slopes will be stabilized and blasted. Disturbed areas will be restored with a natural soil cover and a variety of seed mixtures to encourage the return of native species. Additional tasks will include operation of the active water treatment system located at the toe of the on-site tailing impoundment, installation of a passive treatment system to replace the active water treatment system, and adit closure activities. Nobis previously performed remediation services at this site under a USACE 5-year, $25,000,000 Remedial Action Contract, where they managed and executed the capping of waste materials and the operation of the site’s water treatment plant. This work, completed in 2016, included the consolidation and capping of over 300,000 cubic yards of waste rock and tailings, the treatment of 20,000,000 gallons of contaminated water, and the implementation of innovative green remediation strategies which led to the project being selected for the 2014 USACE National Headquarters Green Dream Team Sustainability Award. “We are tremendously pleased and grateful Nobis has been chosen again by the USACE New England District as their Elizabeth Mine site partner and remediation contractor for the next five years. Along with our team members, we look forward to delivering excellence, responsiveness, and results to the New England District, the EPA, and the community” said Nannu Nobis, CEO of Nobis Engineering.